Born the eldest of 4 children, Candice’s lifelong relationship with horses began at the age of 3 when her favourite uncle placed her on his 4-legged companion Banjo. Horses were already in her blood, passed down from her Grandfather who in the ’30s owned 10 teams of workhorses which he rented out to other farmers to till, plant and harvest their crops. Although it would take a number of years before a love of horses would lead her to actualize the path chosen for her by the herd. As a single mother of 2 amazing beings, most of the past 30 years has been given to a full-time career as a Production Accountant, a specialized Analytical, deadline orientated position in the oil and gas industry. Reaching the status of Manager, Candice then became instrumental in teaching up and coming Production accountants. Having always been drawn to healing, in her spare time Candice attended many courses, workshops and retreats in spirituality, soul studies, self-understanding, Herbology, Iridology, Natural Horsemanship, Barefoot Trimming, and in 2017 attained her Masters in Holy Fire Karuna Reiki. Being the granddaughter of a Seamstress, Candice also pursued her creative side, and with her mother attained her International Foundation of Doll Makers Certification. This led to a number of years whereby Candice taught Doll classes out of her mother’s Ceramic studio. Although horses were present in one form or another along the journey thus far, it was not until 1993 that Candice realized her dream of once again sharing her life with a horse, Shadow, and since that time horses have been constant companions in her life. Currently Candice and her husband Ron, partner and share their lives with 24 horses, 2 dogs and 4 cats on a beautiful ¼ section of land in Water Valley, Alberta. As a volunteer and board member of the Wild Horses of Alberta Society, Candice not only has the privilege of sharing her life with Quarter Horses, Morgan’s, Canadians, Lac La Croix Indigenous Ponies, but also the added presence of the Alberta Wildie. Receiving “One with the Herd” (Liz Myten Ryan) and “The Way of the Horse” cards (Linda Kohonov) as gifts, led Candice to pursue her dream of creating a space whereby Horses can be seen in a new way. 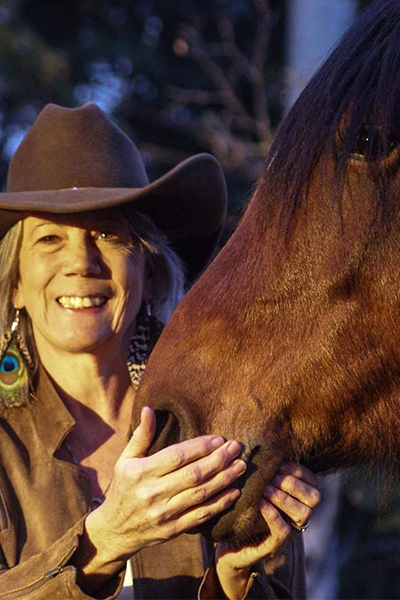 Hearing the call of her herd, Candice began attending workshops, courses and retreats from some of the prominent spokespersons in the Horses as Teachers and Horses as Healers field and was eventually led to FEEL, Facilitated Equine Experiential Learning, and obtained her certification as a FEEL Practitioner in October 2018. Candice’s path (tethered to horse’s) chosen and supported by her herd, is to combine her teaching, spiritual and healing gifts to create and facilitate a sacred space whereby these amazing beings are free to share their Wisdom and Healing, to promote the Magnificence of their Spirit, the Unconditional Love of their Soul, and in doing so present their Authentic Being to the world. The dream is becoming reality and in 2018 Equisoulace (Equine Guided, SoulAssisted, Experiential Learning & Healing) was born. Planning to Specialize in EGAVE (Equine Guided, Accelerated Vision Experiences) Candice and the Herd are creating a space whereby Horses and Horses guiding Humans can re-discover their connection to self, to nature, and to spirit.